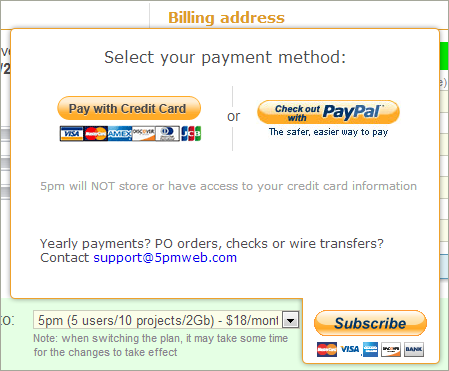 We just added a new payment method to our 5pm monthly plans. Before that all monthly payments were processed through PayPal and required to create a PayPal account. Now we added the possibility to process credit cards without leaving our website (through Stripe.com) and without the need to create a PayPal account. As before, 5pm does not store the credit card information and we have no access to our clients credit cards.